Ever wondered about the logistics of camping with cloth? 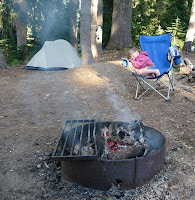 Camping seasons coming to a close, but have you ever wondered about the possibilities of camping AND using cloth diapers? It's almost winter so camping season is pretty much over depending on where you live. But if your family is like mine, you'll be heading outdoors to camp again as soon as you possibly can. Many families choose to use disposables for camping, but if you'd rather use your cloth, here are some tips to have a great trip. 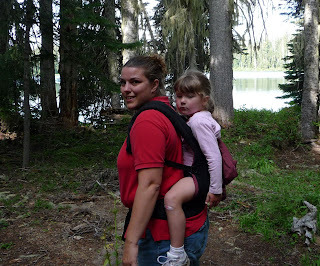 Short Trips: If your camping trip is just 3-4 days or less, then you can easily use whatever diapers you currently use. Pack every single diaper you own, even the ones you don't like. Even the old prefolds that were best used as burp clothes or dusting rags. Pack all of your cloth wipes and a big bottle of plain water to wet them with. If you have two pail liners (the big bags for storing dirty diapers in the diaper pail), take them both. Fill one with the clean diapers and add dirty diapers to the other throughout your trip. Twist the top of the dirty bag so it'll keep the smells inside the bag. If you camp near your car, then keep the dirty bag in the trunk. I don't recommend keeping it outside because it could attract animals who might chew through your bag and damage diapers. Can't have that happening! We used our car's back seat as a changing table, but you can use whatever surface you have handy. If you'll be hiking away from camp a lot, also pack a wet bag for dirty dipes when you're away from your campsite. Basically, for short trips, cloth diapering is just like at home, except you'll need every available diaper since you won't be washing. You'll want the thinnest diapers possible--faster to wash, faster to dry. If you normally use pocket diapers, take them...they'll still work great! Whether or not you want to wash your inserts is up to you; microfiber inserts do usually dry pretty fast so you'll probably be fine with them. If you normally use prefolds or AIOs or anything that takes a long time to dry, you'll want to invest in a set of very thin diapers. I've heard flats are the best way to go. Flats can be folded however you want and can be used in either covers or pocket diapers. They are basically a 1 yard piece of hemp or cotton fabric. They're usually really cheap and they are OneSize, so you won't need to buy that many. A dozen or two will be plenty, depending on how often you want to wash. However you wash things during long trips, make sure you bring enough detergent to do your diapers. I've heard of families using Dawn dishsoap or something very environmentally-friendly, then washing in lake water or stream water. Whether you choose to do that or use fresh water or trek into the nearest laundromat is up to you. Taking a bucket will probably be helpful. Take a clothesline so you can hang your diapers. Pockets, covers, and flats will dry within a couple of hours. Microfiber inserts will probably need overnight unless they're hanging in direct sunlight. Be prepared for diapers to get dirty, to have grass or burrs stuck to them, etc. If you have an expensive favorite, it's probably best to leave it at home. But otherwise, cloth diapers are plenty durable for a camping trip and your little one will be so comfy in his or her usual diapers. So don't be afraid to use your diapers and have a great trip! One last picture! This was over a year ago. Our daughter was 4 years old and right at 40 lbs. I wore the empty Ergo until she was too tired to walk anymore, then she rode in style. Even at her weight, it was very comfortable for both of us. Who says Ergos are just for babies? !